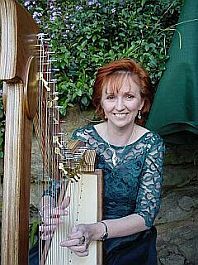 Alison provides soothing harp music creating a peaceful atmosphere, perfect for weddings and intimate functions. Specialising in Celtic & Australian music her repertoire expands out to include many other styles including Celtic covers of popular songs. She can provide anything from solo harp through to a 4 piece band playing Irish & Australian music (traditional & modern) to get you dancing & singing along. Alison has performed both nationally and internationally for weddings, parties, festivals, concerts, community events, Irish sessions, amusement parks, cruise ships, private and corporate functions, tourists, fundraisers, bush dances and Ceili nights. She played in Sydney Town Hall at a reception for the President of Ireland, Mary McAleese. Alison also plays:- Irish whistle, flute, piano accordion, bodhran, keyboards, bouzouki and vocals. "Heard you at the Rocks doing some Irish tunes. Your combination of whistle & guitar is fantastic. I have not heard the whistle played like this before - so fast & rhythmic, cheerful & hypnotic." "terrific-good live entertainment-toe tapping stuff!!" "..thank you and your band for your beautiful & lively music on our wedding day. We still have some of the music, singing & dancing on our video so we will enjoy it for years to come."